Assignments, Tests and Surveys (ATS) has a single list of all the assessments the learner needs to work with. Note that there is a score and information as to when review will be available in the last item. Score – Column shows total points earned and (optionally) a link to Review of results. If Review is set to ‘immediate,’ a link to Review is available upon completion. If Review is not available until a specific time, the date of Review is listed. If the assessment allowed multiple attempts, the highest score is listed. Upon clicking on the title of an assessment in the list of assessments, learners are taken to a “Ready to Begin?” page that includes instructions (if provided by the instructor) and system notices. Learners can begin or cancel. System notices are included for flexible order, strict order, and timed assessments, providing learners with clear information about the setup of the assessment, instructor choices, and the behavior that they should expect. The action bar is included at top and bottom of all pages of an assessment. ‘Finish’ is included on every page, along with Continue Later, next, previous and Table of Contents (TOC). In strict order assessments, however, students cannot return to answered questions and have no access to the Table of Contents. In strict order assessments the Prev and Table of Contents buttons are grayed out. Students can review Instructions from any page while working on an assessment via a hot link on the action menu. Learners have access to all instructions (instructor instructions, timed, flexible order, strict order, or part instructions) via a link at the action bar of an assessment, accessible from every page of the assessment. The most common navigation order established for assessments by instructors is ‘flexible’ order. In flexible order assessments, students are allowed to move forward and return to previous questions, leave questions unanswered and mark them for review and return to them later, and revisit their answers and change their minds. They have previous and next buttons and access to a table of contents. In Assignments, Tests & Surveys (AT&S), if an assessment is set to “strict order,” it means that learners can answer (and not simply ‘see’) a question only once. Students are given clear instructors as to what to expect in strict order assessments. 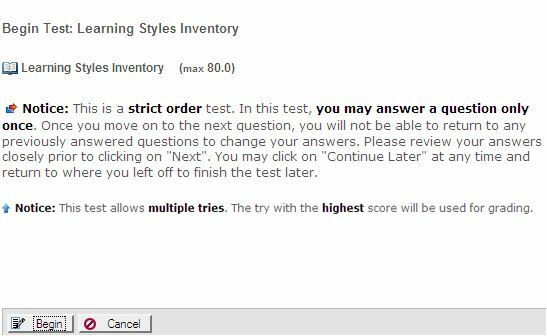 The “strict” order option is only available in tests and surveys. In strict order assessments, learners can see a question, leave and continue later, again, quite again, etc. However, learners can only move forward. They cannot go to previous or the Table of Contents. They can enter or exit an assessment as often as they like till they decide that they are done with a question. Once done, they cannot return to the question. 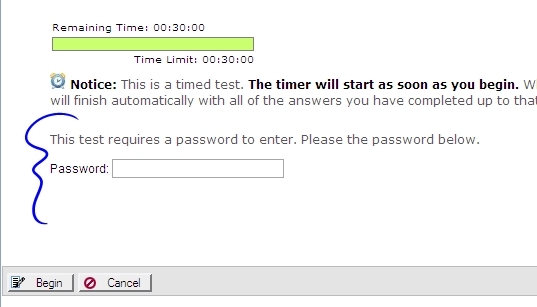 If learners click on “Continue later” and return, they are taken to the last unanswered question. If learners ‘see’ a question but don’t answer it, AT&S alerts them to answer it. But, the software doesn’t keep them stuck. Learners can proceed to Next, after the alert, leaving a question empty. Special instructions are added at the beginning of strict order assessments to alert learners that they can answer a question only once. The instructions are included in a link at the action bar on every page. If an assessment has only one question (i.e. assignment), there is no numbering in delivery. The Table of Contents and Next and Previous buttons are not available in 1-question assessments. Setting your assessment to display one question per page is highly recommended as if students lose their internet connection or if they experience browser or computer issues, they will not lose their answers. When students answer one question per page, when they click on ‘Next’, their answer is saved. For short surveys and quizzes, choosing to display them on one page is efficient. If there are technical issues, not much is lost. Students can answer the questions again. When many questions are listed on one page, the responses are not saved until the student clicks on ‘Save” (there is a “Save” button next to each question), or clicks on any of the other buttons in AT&S, such as Next, Continue Later, Table of Contents, or Finish. For assessments that are set to display all questions on one page, if a student is taking a test, and instead of pressing a control in AT&S (they all save! ), presses a control from the site’s menu or the navigation bar, or the top portal menu options (i.e. Account, Preferences, etc), and leaves the test in the middle, the work completed on the page is saved, as if the student had clicked on “Continue later.” No work is lost. When students return to the assessment, they can continue from where they left off. For students who are used to, and nervous about, how computers and internet connections crash, and want to save their work often, AT&S offers a “save” button on each question’s title area. Save will save the work on the page, and return the user to the question from which they pressed save. The software can’t protect students from crashes and internet connection issues, but, they can save often. If the assessment includes dozens of questions, having them all on one page and losing one’s responses can be frustrating, particularly if there is a pressing deadline. But, you can remind students to save often, and when doing so, the “All questions on one page” format is safe, too. Include “Reason for Answer” is a setting that instructors may check in their assessment questions during author to require learners to give a reason for their answer. “Reason for Answer” has its own icon in the legend of the table of contents. Thus, if learners have left the “Reason for Answer” text box empty in a question, it will be highlighted for them in the Table of Contents. (See legend in the above screen shot). Upon clicking on Finish, if learners have left ‘Reason for Answer” boxes unanswered, they are reminded to return and add a reason before submitting their assessment. By design, all timed assessments are auto-submitted when learners run out of time. Additionally, AT&S treats assessments with hard due dates (i.e. no late submissions allowed) as timed assessments. If learners begin taking an assessment that has a hard due date late, they will see a “near due” timer. “Near due” is defined as within 2 hours of the due date, for “no late expected” hard due date assessments. 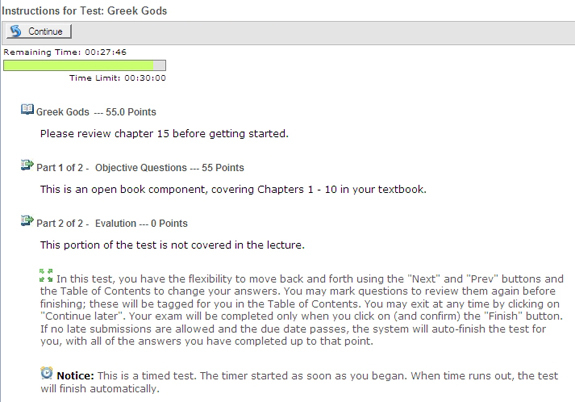 Students see a timer in the “Begin” screen and in all the question views (question, remove upload, TOC, instructions). The timer is also shown in the list view. The timer sits in the “due” column in place of the normal date display. It’s displayed, running, when the assessment is within 2 hours of due. 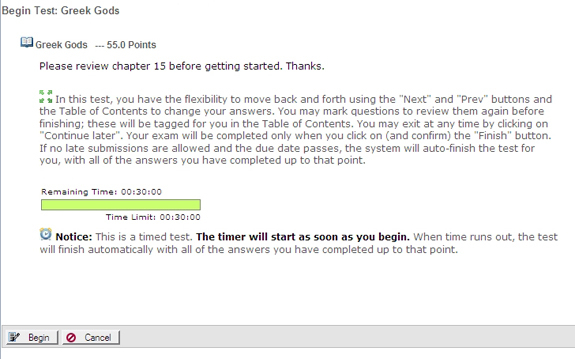 It only shows with the status is “ready,” “in progress”, or if the assessment is near due; this means that the timer only shows if the learner has not yet completed the assessment. If the test has been completed or if the assessment is actually past due, AT&S shows the normal text display. The ‘near due’ timer turns red when the due date arrives. When the hard due date is reached, the assessment will be auto-submitted, saving the learner’s answers. If a learner is in the middle of an assessment with a hard due date, exits to continue later, and returns to the assessment after the due date (and grace period) has passed, she will find the assessment is auto-submitted, with whatever answers the student has completed, or no responses, if the student had failed to work on the assessment. Whether learners are just sitting on the screen, staring at a question, at the TOC, or exit to continue later, when the hard due date reaches, the assessment will be auto-submitted for the learners. Learners can finish an assessment from any screen, if they are done or partially done. Finish is available from any question and the Table of Contents. When there are no unanswered questions and no questions are marked to review prior to finishing the assessment, upon clicking on Finish, AT&S submits the student’s answers after a single ‘Finish’ confirmation for the learner. The other Finish behavior is when a learner has left questions unanswered. Upon clicking on ‘Finish’, AT&S takes learners to the Table of Contents, where they are alerted about what’s not completed. Learners can complete what’s not answered, review what’s marked to review before finishing, and fill in incomplete “Reason for Answer” text boxes. Learners can click on Finish at any time to complete the assessment. Even if questions are unanswered, upon clicking on Finish, after a single confirm, they can finish an assessment. Depending on the instructor’s settings, students can review how they did in their submissions. AT&S makes use of review options under ‘Settings’ to show feedback to students. NO feedback, answer key, or automatic scoring is shown to learners during an assessment. When creating questions, instructors can include “hints,” which can be made available to students during testing, if enabled in settings. Below, you can see the options that instructors have with regard to what they can allow students to see during Review. Student access to Review (correct / incorrect answers, feedback, evaluation comments, and points) will be available once the instructor releases the submissions in grading. This mostly is used for non-objective questions, such as essays and assignments that need to be manually graded. If review is set to be displayed to the student “at a specific date,” learners will see Review after that date, as described in scenario 1 above. The date as to when review will be available is shown to students in their list. As in scenario 1 above, learners will see their total score in List View and in the gradebook, if the assessment is set by the instructor to send scores to the gradebook. Learners will never see Review (unless the feedback settings are changed later by the instructor). Learners will see their total score in List View (and the gradebook, if set by the instructor). 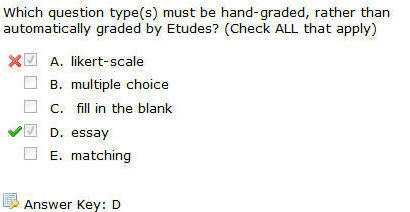 Note: No feedback, scores, or answer key is shown during an assessment in any of the above scenarios. The following shows the options that instructors have for grading. Their choice affects whether learners will see a total or partial score in Review and in the gradebook. When Send to gradebook is not checked, no scores are shown to students in the gradebook. When Send to gradebook is checked, students will see their total scores in the gradebook. 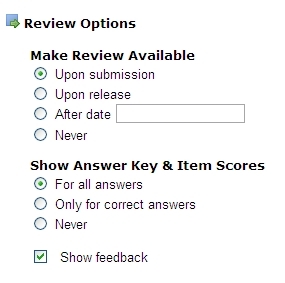 If Automatic Release is selected, in combination with enabled review options, students will see their score. However, it may be partial if the assessment included essay questions. The word “partial” will be next to the score. When the instructor grades the essays and releases the submissions, “partial” will be replaced with the total score. 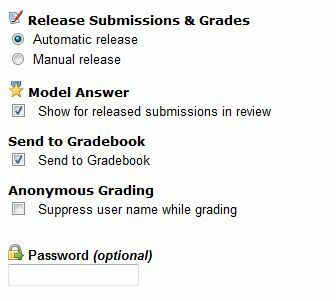 Instructors can leave Send to gradebook unchecked while they grade essays and set the assessment to Manual Release. This way, students will not see a zero or partial score. Once instructors are done evaluating the essays, they can check Send to Gradebook and release individual or all grades and their comments to students. Students know that their assessment was submitted by the submission date / time stamp that will be displayed in their view, immediately upon finishing an assessment. If an assessment was not submitted for grading, and the due date has not passed, learners can re-enter the assessment to take it. If students took an assessment more than once, if allowed, they will see the number of submissions sent, including the start and finished date for each try, as well as the exact submissions (answers, attachments, etc.) they turned in for each. Upon finishing an assessment, the learner is taken directly to Review to see how they did, if the instructor’s settings are set to allow immediate review. If review is not yet available and review is not set to ‘never’, students will see the assessment and what they submitted, but they will not see any answers, model answer, feedback, or scores and evaluation comments. If multiple submissions were allowed and all were graded and released, students can browse through each of their submissions by using the Next and Prev buttons in the Review screen. The “best” submission is marked as such, in between two stars to stand out. The “best” submission is the one with the highest score – the one sent to the gradebook. If the instructor selected “No Review” or “Show Review at a Specific Date,” students will not have access to the assessment questions, answers, feedback, etc. They will see the date, if set, when Review will be available. All the questions that the student was served and answered during the assessment. ‘Answer Key’ and ‘Feedback’ are shown and highlighted in bold and with unique icons. Grader comments (overall and for questions) are highlighted in boxes to stand out. A note icon is provided for additional emphasis by the grader’s comments. Model answer (if included) is highlighted for learners with an ‘award’ (gold star) icon. The total grade and item scores are also flagged with a ‘grade’ icon. 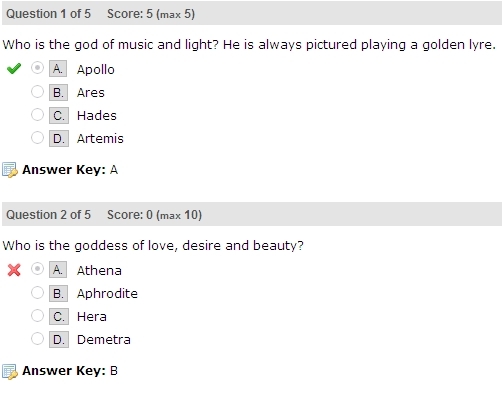 If show answer key and scores is enabled, students will see the questions and what they got right or wrong. AT&S supports a password for additional security when giving high-stakes assessments, particularly in a proctoring facility or classroom. This is an additional password to the login that learners use to enter the system. If a password is added in AT&S settings of an assessment, the learner is prompted to enter the password prior to gaining access to the assessment. Once the learner is in the assessment, he may re-enter it as many times as he wishes, within the open/due dates, including logging out and returning, without having to re-enter the password. The instructor may assign a different password for some learners, as needed, using the Special Access feature.